@EA_Andy I have to say that this reflects a continuing trend of being disconnected from the forums. As many have already stated, we tend to stay in our respective sections, for the most part at least. We have a little community, with many of us building friendships off the forums. Some post "OT" subjects on the XBOX section because they are wanting to talk to the community that they are involved in. I understand the reasoning behind it, you want to have a tidy forum where people talk about specific things in specific sections, but the XBOX community centre in particular has evolved beyond that. Instead of ruining already well established communities, you should concentrate your efforts on cleaning up General Discussion. In my opinion, the multitude of moronic "on topic" discussions that are opened there almost every minute, are far worse than the 1 or 2 OT discussions that are opened daily in the XBOX community centre. I would like to ask you one question, why don't you start asking well established forumers what changes they would like to see on the forum? Get us involved, instead of making these divisive changes that only serve to upset the majority. Wholeheartedly agree with @Knowlesdinho. This is an interactive forum between the community. Heck, I'm not even on Xbox anymore, but given the years in CC side, it's pointless to move elsewhere. This change will now disconnect a number of us and/or not bother about asking questions - some (without exaggerating) affect people's lives. And, to second another point made in his post, why not poll the respective communities prior to making a pretty drastic change like this? EA continue to live up to the tag that you really don't care about the people that are literally enslaved to your product. I think the majority of the times when thing aren't Fifa related we note "OT" at the start so people don't enter those threads looking to talk about Fifa. It can be simple stuff, perhaps Xbox related issues or just general chat with the people we interact with in that section. Harmless really, what's the problem? @EA_Andy will this be addressed? As a lounge owner myself, I received no prior information or heads-up regarding this move, so this caught me unawares. The fact that the mods here insist of stuff nobody wants is a perfect reflection of their employer. Sure, the lounges in a separate off-topic section may make more sense from a purely logical point of view, but in the real world, having them in the FUT section was what made them popular in the first place. Maybe you could have added a "Lounges"/"OT" section underneath each separate FUT section? That way you keep the lounges at the top of the forum home page, keeping them nicely visible, while also cleaning up the individual sections without breaking up the communities. Why not give us some say in how we want things? The fact that absolutely no-one here supports the decision should tell you that you did something wrong, not something right. Can you not distinguish between right or wrong? Or, as I suspect, do you simply not care between right or wrong? Thanks for all the feedback and opinions on this change so far. I don't think I ever expected everyone to be completely on board with a change like this straight away. Change often causes disagreement and it takes time to get adjusted. Just because something has "always been like this without issue" doesn't mean it should never be changed. I understand the point about the communities that have built up in certain sections and that perhaps some of you aren't as connected to FUT as you once were but still enjoy using those sections. I think it's worth noting that as well as the already established communities there are lots of new players visiting the forum every week and to me the experience of entering a FIFA or FUT section and seeing discussion about other games or sports would be a little strange. I'm a user of plenty of other forums and I don't think I can recall any that allow off-topic discussion outside of the off-topic section (and plenty don't allow off-topic at all). There is an argument that these threads are few and far between and don't disrupt. That might be the case but on the flip side if they're that few and far between they're more likely to get lost in the FIFA discussion. Now they're more visible in their own forum as the off-topic forum will naturally be quieter. Given that we haven't removed the major threads, nor have we removed the ability to discuss these topics there wasn't advance notice given. There's not really anything that needs to be changed with the threads themselves other than a different location / URL. Any bookmarks should still work at the new location. As for whether the move was right or wrong that's going to be up to each individual to decide, it's your opinion after all. I feel we've made a move that will mean off-topic threads don't get lost and have their own dedicated section for discussion. It will also mean that those that purely want to talk about FIFA and FUT have their sections too, whether that person is a well established part of the community or someone new to the forums. I appreciate that everyone would like a say or vote into everything we do but sometimes we have to make a decision that we think will be better for the long term. Suppose it keeps more threads about opening packs on the main pages instead of things people actually want to discuss. The OT section will be dead and those of that want to discuss other things will just go elsewhere. And inb4 you can still talk about other things in the section, I could also talk to a brick wall as its probably got more life in it. Truly annoyed, how can you treat your regulars like this ? 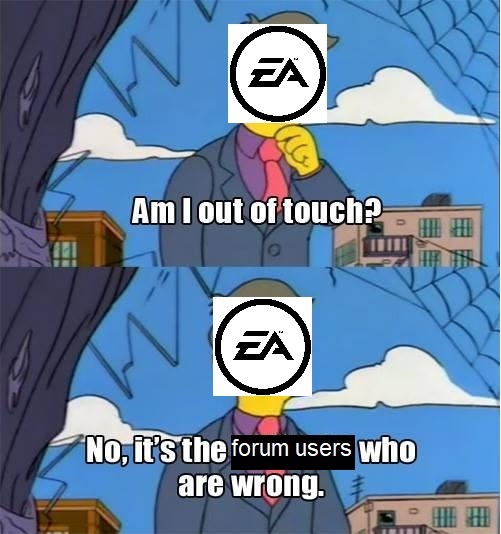 Oh wait you work for EA. Silent, sneaky, disingenuous. You mention you don’t expect everyone to like the changes but I don’t think anyone at all thinks this is a good idea? You mention that just because something has been this way doesn’t mean it shouldn’t change but just because someone has an idea it doesn’t mean it’s a good one? Hope peoples feedback is taken on board. Tldr: thanks for your feedback but we wont do anything with it. Based on nothing we think some people agree on this. Its not about bookmarks, ogs will be fine. Its about the new people trying to enter threads. Might aswell merge all the different communities into one. "Pack propaganda centre and free support centre because our live chat is as useful as a chocolate teapot"
Since people on mobile don't see the latest post on the forum home page... maybe post an announcement in each section explaining where all the lounges have gone? Some people may not have have had their lounges bookmarked... and posting a little heads-up doesn't hurt. Literally every single person here has voiced what a terrible decision this is and instead of taking the feedback and doing anything with it you just double down on the decision. That's some quality community managing Andy. What do you think they'd have issues with when it comes to new threads out of interest? I would imagine that most people that first visit here are coming for FIFA and not off-topic stuff. Once they like the FIFA stuff they can branch out and look towards other things being discussed. At the same time I don't think you can judge a change after 24 hours of it being implemented. You often see things change, people don't like the changes initially but after some time it doesn't seem as bad as it initially did. It's difficult to say right now if it was the completely wrong call. Awful decision. While those threads do have a lot of real football talk, there is also UT talk in those threads with people posting their teams, asking for suggestions and talking about UT players from those leagues. Most of the threads moved over will die. Its about lowering the treshold. People dont want to put any effort to seek for things. Thats why you have to makr it easily accessible and easy to navigate. Now when someone makes an interesting OT Thread like @Knowlesdinho did. No one will care cuz the treshold has been raised, any barely anyone wants to go and explore cuz the reward might not be there. The OT threads were an extra that kept users stay and involved in the community. Also when new forumers enter, they come for fifa first, but then they want to expand their interest and share their findings with other stuff, and that wont happen now, cuz the treshold is high to find out. And people wont really expect to find an ot thread of other games or irl stuff on fifa forums. But thats what made the fifa forums fun and good. I fully support this change. I for one come on the EA Sports FIFA Ultimate Team 2019 forums to see neverending threads of people complaining, opening packs then complaining about their packs, threads about why Weekend League is unplayable despite OP playing 30 games week in week out, and much much more. Until today these threads were always overshadowed by the off-topic lounges, contributing little to nothing to the high standard of discussion on these boards. Removing these lounges finally leaves us with the quality threads we bookmark this site for. Keep up the good work @EA_Andy! I've asked for mine to be deleted, I just had no desire to continue if it wasn't going to be for the community that I feel part of. @EA_Andy I agree with the point that @Choepiechakie makes here. Often the OT discussions would have FUT related content in them. My Football manager thread for instance would have ultimately contained many winks and nods to FUT, and the community. You say that it's too early to judge a change after 24 hours, but had you have polled the community, I feel that you would have seen overwhelming support for OT subjects to still remain in the various community sections. I reckon very few people wanted to see a change like this. 1:People joining to rant about how bad the game is, and they usually get banned within a day. 2:People joining because EA support has sent them here to fob them off, they usually don't stick around long either. This simplifies it to a degree, and there will be other categories, and sub categories etc, but I feel that most people would agree with what I've posted above. This change has only served to further disengage a waning community. I used to love this place, but I've grown tired of it, and I'm barely posting at the moment. I haven't even got the motivation to help the people that I normally help on my BPM thread anymore. Without being big headed, I feel that I'm probably quite an influential forumer on the XBOX section. I have a good track record on these forums, so I hope that you read this and listen to what I've said. The way things stand, I'm on the verge of leaving this community. I have my discord that my BPM followers are in, and I've added many people from the forum to my friends list on XBOX, so I can keep in touch with who I need to. I think that it's a shame, I would have loved to have had a further role on this forum.